I was asked by The City Of SLO to paint a skateboard deck for this years “Deck It Out” art show at Coalition. My skateboard will be auctioned off the night of the show with all proceeds going to the SLO Skateboard Park. 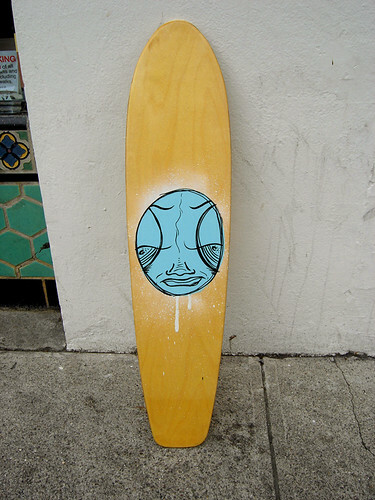 If you’d like to purchase this board please go to the event on November 5, 2011 at Coalition. If you can’t make it to the event you might be able to get your bid in over the phone. Call Coalition to find out, 805.595.1010. Feelin’ It from Zachary Stowasser on Vimeo. Check out this awesome skate video by videographer Zachary Stowasser. I love the plethora of camera angles and color chages. Most skate videos are filmed by one dude on a skateboard using a fish eye lens as he follows the other skater doing tricks. Which is totally fine and dandy, however, this film by Zachary not only documents some great skate footage, but it does so in an artistically unique way. Have you heard of “regifting“? This is kind of like that, but instead of receiving a gift and then giving the gift to somebody else I returned it back to the original giver. Awhile back my friend Matt (check out his awesome creations at baxtermoerman.com) gave me this skateboard that he had made. He knows I like to paint on stuff and he wasn’t going to do anything with it, so naturally I was happy to take it when he offered. It’s been laying around in the gallery for awhile in the “things to paint” pile. Well, lo and behold, I’m on facebook the other day and see lots of “Happy Birthday, Matt!” comments. Right then and there I decided to regift the skateboard to him for his birthday, but not before I embellished it a little bit.